Daily Illuminator: The Ultimate Gaming Table? 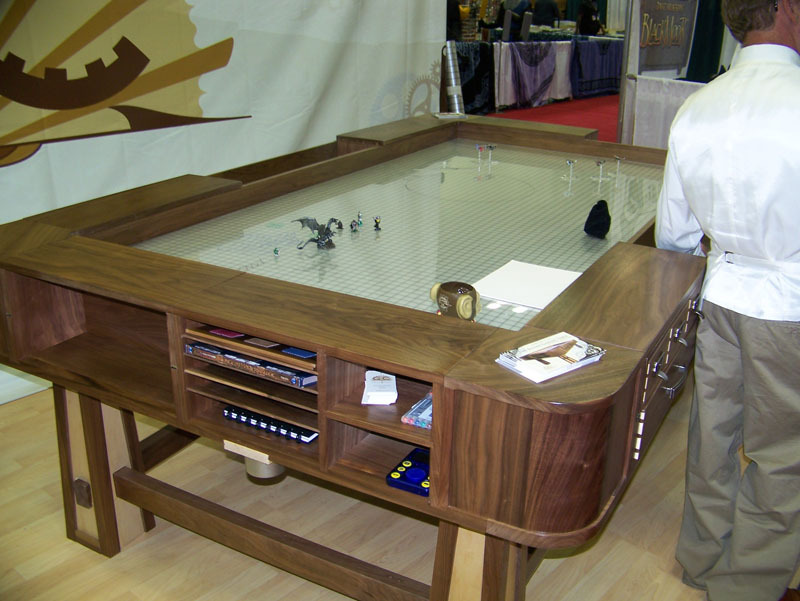 September 2, 2008: The Ultimate Gaming Table? At GenCon, many things fall into the "want, but out of budget" category. The king -- dare I say, the Sultan -- of that category was the gaming table offered by Geek Chic. They call it "The Sultan." Drink holders, dice rolling trays, a dry erase board that's lit from below, and more nooks and crannies than you can shake a stick at. This thing is made of beautiful material, with a ton of drawers for organized storage, as well as a reversible cover for the white board -- felt on one side, wood or copper on the other. There are too many features for words; they really need a YouTube video tour of the thing. The price tag is ten grand, which is a darned sight out of my gaming budget, even if I did have a place to set it up (which I don't). But for that price, they deliver it to your door.